Also known as the Highway Patrolman, This is one of the heaviest and sturdiest .357 revolvers you could buy. The gun is a duty version of the classic M-27, which is the original .357, which has it's roots in the 1920's production of the S&W Model 38/44. The 38/44 was chambered as a standard .38 (using a .44 frame and cylinder, thus the 38/44 model designation); it was planned to have special high powered .38 loads for this gun only. In 1935 these high powered cartridges were modified to prevent their use in a standard .38 revolver, and the 38/44, was developed into the model 27, which was rechambered to accept them. The Model 27 has always been a premium revolver, and was far too expensive and fancy for duty use. 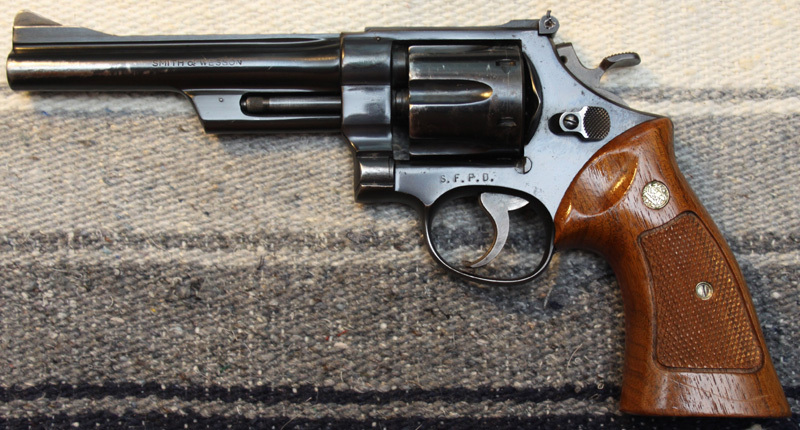 In 1954, S&W introduced the Highway Patrolman, as a duty version of the Model 27. The gun was renamed the Model 28, in 1957, and was produced until 1986. This gun is built upon the highly regarded N frame, which is the same frame and cylinder as used on the .44 Magnum, model M-29, which Clint Eastwood immortalized in the Dirty Harry movies. With it's thick cylinder walls, and heavy frame, this gun is an ideal platform for the ambitious handloader. 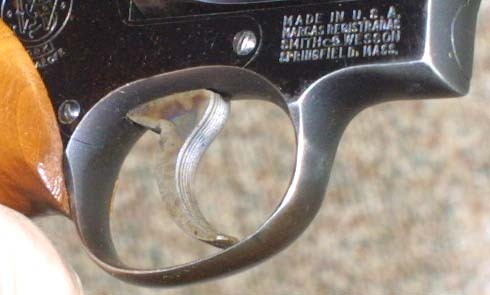 More recent N frame revolvers have used this same cylinder bored out for eight rounds. I prefer the extra strength of the older models, to the addition two rounds in the later versions of the M-27. The M-28 never had an eight shot version. The model 28 (and the similar M27) was designed for this powerful cartridge from the start, unlike medium frame service revolvers, which are essentially.38's chambered for the .357 cartridge. The action is smooth, and the adjustable sights are good. The gun is accurate and easy to shoot, particularly with the heavy recoil absorbing frame. I can shoot this piece all day (with .38's) without strain, and can usually group within three inches. The huge cylinder does not lend itself to casual or concealed carry, but for a field piece or a duty gun, worn openly, it is hard to fault. Some shooters worried that S&W may have cut corners, or reduced the utility of the gun, in order to reduce costs. Others rumored that the gun was not as smooth, or accurate as it's more expensive parent. From personal experience, the trigger pull of the M-28 seems a bit stiff, as opposed to that of the Model 27. This may be due to a bit more polish at the factory, or may be because of the wide target trigger on the Model 27, as opposed to the combat trigger on my Model 28 's. Because these guns, along with my Model 27 were bought used (the only way to buy them since the M-28 has been out of production since 1986, and the M-27 ceased production in 1994), it may be that one or more of these guns were worked on by previous owners. 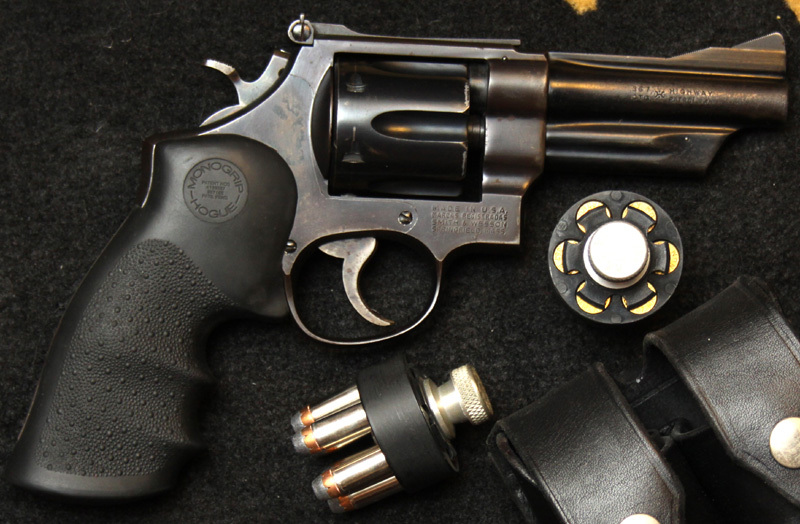 The major cost cutting efforts were made in the way that these duty version revolvers were finished, and in the many luxury, and vanity features which they left out. Though this was not a top of the line gun, being designed as a duty pistol, the fit and finish are good, and the trigger, and handling qualities are very good. The primary differences between the M28, and the M27, are the 28's lack of white insert sights, the sandblasted finish along the top, bottom, and backstrap of the M28 (as opposed to the mirror like finish of the 27), the sandblasted sight plane (as opposed to the grooved sight plain of the M27), and the lack of a target hammer, and target trigger as standard items. Target hammers were ordered as extra cost options on some guns. The gun was also not available in nickel, or with the fancier deep blue of the M-27. It does not have the option of the long 8 3/8" barrel, but it does feature adjustable sights, and is the same gun physically, and mechanically. A comparison of the two models can be made by going over to my M-27 page. For the law enforcement office, who wanted to get his hands on a big magnum, these fancy features were not missed.A look at the photo above, particularly when compared to the similar photo of my M-27, tells the whole story. These guns were not designed as toys, showpieces, or as a rich man's gun. This was a working tool, a field grade gun, which was designed to spend much of it's life in a holster, rather than in a display case. The word "serviceable" comes to mind. These guns will take the same holsters as the M-27, or as any of the other N frame models, including the Model 29. They will take the same speed loaders as the M-27. The most common barrel length for the Highway Patrolman seems to have been the four inch, and the most common holstering method was the common belt holster. 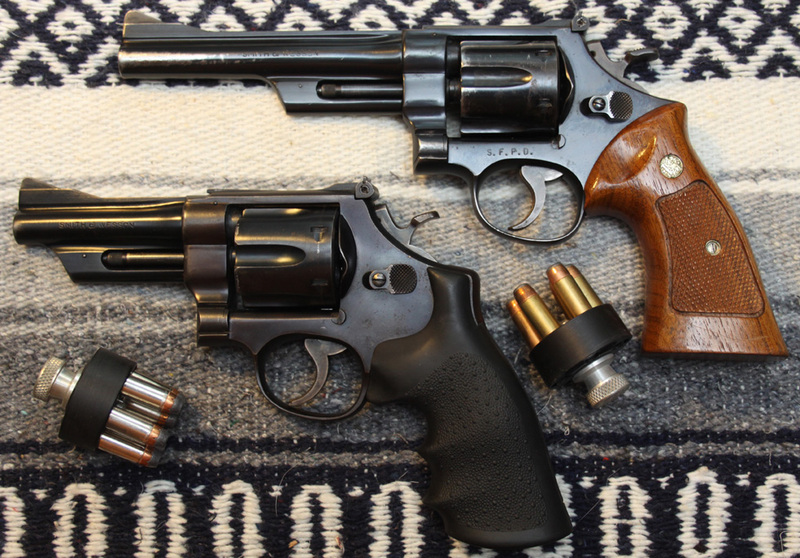 I personally, own two of these great revolvers, one with a four inch barrel, and one with a six inch barrel. The massive framed gun looks a bit stubby with a four inch barrel, and really for a magnum pistol a four inch barrel is a poor choice. Where the four inched barrel gun really excels, is in firing .38 specials with a very comfortable amount of recoil. It is also reasonably handy, with the shorter barrel, though none of the N frame guns are what you would call compact. The shorter barreled gun fits, and carries well, in a regular belt holster, and makes a great field gun. This particular example has the grooved combat trigger, the target hammer, and adjustable sights. it also sports a set of grooved rubber grips. The finish is quite worn on this gun, but the actions remains smooth, and there is no visible rust. This is not uncommon on the M-28, as these were considered duty guns, or utility guns and were not pampered in the manner of the more expensive M-27. I do not know the history of the four inch model. The gun looks, and seems to balance just about right, with the popular six inch barrel, and the ballistics are vastly improved, at least with the .357 loads. Magnum ballistics depend upon slow burning powders adding velocity through a longer barrel. This cartridge was initially designed for 8 3/8" barrels, and a six inch should be considered a minimum, for the use of the magnum loads. The longer barrel also adds a bit to the length of the sight radius, allowing me to tighten up my groups, just a bit. The extra length, and weight, along with the slight forward shift in the center of balance, add marginally to the stability of the gun. The six inch gun is a former SanFracisco police gun, retired in the eighties. It has a badly worn finish, some surface rust, and a number of scuffs and scratches. Police guns often lead hard lives. I like the idea of having a former SF police gun, and though the gun was likely never removed from its holster, the history gives it character. The gun is marked under the cylinder with S.F.P.D. to identify it. I will need to exercise care to retain the markings when I refinish this gun. The six inch version has the standard target grips, the usual adjustable sights, grooved combat trigger, and target hammer. Generally, uniformed police officers carried four inch guns, which makes me wonder if this was a detective gun or a tactical officer gun. A shoulder holster is a bit better way to carry a longer gun, than the standard belt holster of the uniformed officer. I plan to refinish both guns, either in blue or electroless nickel, and will document the process on a different page, when time permits. Whichever finish I use, each gun must be completely disassembled, cleaned thoroughly, and have all finish removed. I am leaning towards electroless, because of it's better protection, and the nearly identical amount of effort, and money when compared to a home bluing job of good quality. The electroless process is also considerably faster (about an hour) than a genuine blue, of good quality (as long as several days).